Luckily, with the advances of wearable technology there has been a push for inclusion in the medical field. Healthcare wearables are becoming increasingly common in doctor’s offices and patients can look forward to the conveniences of modern technology. Virtual Reality devices are picking up steadily in the market as a luxury item, but impressive developments are happening between VR and rehabilitation patients. Let’s look at the current ways Virtual Reality are helping those with disabilities, and speculate a bit on what the future may bring us. Post Traumatic Stress Disorder (PTSD) is a serious mental condition that affects thousands of Americans: from veteran soldiers, to victims of abuse. PTSD can manifest in multiple ways, but one of the most common manifestations is severe panic attacks do to a triggering moment. For patients that suffer from PTSD, there is the option of Immersive Therapy through Virtual Reality. Immersive therapy, or exposure therapy, is a unique treatment option that forces patients with PTSD to confront their fears. For example, if an ex-military patient suffers from war-time trauma, the Virtual Reality headset will immerse them in a triggering environment. The sounds and visuals of the VR headset mimic that of an actual battlefield, but the patient will not be in actual danger. Over time, patients will be able to identify they are safe and simply suffering from a panic attack. The benefit of using VR exposure therapy is that it can prevent patients from relying on prescription drugs to help them when in need. Although this treatment path is rare due to hesitancy and lack of education with physicians, it has shown a high success rate over the few years that it has been utilized. Immersive therapy puts the patient in a controlled environment where their doctor can observe their reactions and aid accordingly. Depression is a common mental health condition that Virtual Reality research is beginning to dive into. A recent study published with the British Journal of Psychiatry Open found that VR headsets were successful in reducing depressive symptoms for patients who were clinically diagnosed. In the study, patients went through a process known as ‘embodiment’ where an avatar created in the virtual world represented them. That avatar was then instructed to console a small child that was crying. Once the child was consoled, the patient was ‘embodied’ in the place of the small child. The patient then watched their own words and movements from the other avatar reflected back to them. The study concluded that depressive symptoms were reduced by encouraging the patients to be more compassionate towards themselves. Victims of severe injuries are also finding solace through Virtual Reality. From severe sports accidents to burn victims, patients that have suffered greatly from a traumatic injury are beginning to see the benefits of VR treatment. The main focus with VR in these cases is to aid in pain relief. Amputee victims often suffer from a condition known as “phantom limb” where their mind still feels pain where the limb no longer exists. With Virtual Reality, sufferers of phantom limb have found a form of pain relief without the aid of addictive medications. Studies have also found that patients who participate in VR treatment are more likely to continue their rehabilitation and less likely to be discouraged over time. Similarly, burn victims have been given VR headsets when their wounds are being redressed. Redressing of burns can be severely painful, so doctors began using the headsets in a study to determine if VR helped in pain relief. Although further studies need to be conducted, the effects from the first grouping of patients are very promising. Where will the future of Virtual Reality in medicine take us? 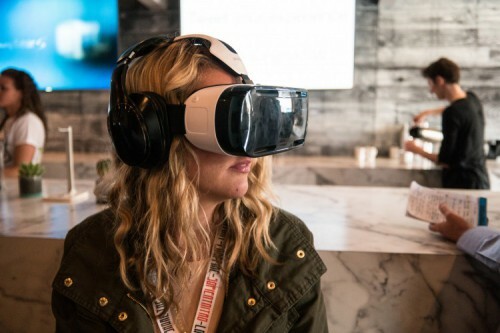 Will we continue to see a push for Virtual Reality and healthcare? The future is bright if wearable technologies and VR headsets continue down their current path to better health. I can only imagine what the future has in store for us next! Katie McBeth is a Freelance writer out of Boise, ID. She enjoys reading teen novels, eating mac‘n cheese, and long walks on the beach. Her love for reading is only trumped by her love for cats, of which she has three. She also has a dog, and he helps keep her grounded. You can follow her animal and writing adventures on Instagram or Twitter: @ktmcbeth. What an incredible break thru this is! I can only speculate on health care costs. I hope this is does not become an issue for people. I know many people this could benefit. Bob, yes! I love the possibilities that VR bring to rehabilitation, and I hope doctors start picking up on the potential soon, too! The price might be intimidating, but companies like Google are making affordable options like the Google Cardboard (smart phone and case is all you need)! Easy and cheap for everyone who is interested in experiencing VR.